UPDATE (6/12/2014; 11:30am ET): A new report from Morningstar Inc. – a leading provider of independent investment research in North America, Europe, Australia and Asia – announced that Marcellus Shale production is expected to account for nearly one-fourth of all U.S. gas output by 2015. With the growth we’ve seen year-over-year, the Marcellus is on track to meet these expectations. According to EIA’s most recent drilling report, production from the Marcellus is almost 15 billion cubic feet of natural gas per day. This is roughly 280 million cubic feet per day of growth month-over-month. The EIA also announced that, “natural gas was the largest domestically produced energy resource for the third year in a row” (emphasis added). With these continued production numbers we can expect to see shale development and the vast benefits that come with it to continue for decades to come, not just in the Marcellus but also in shale plays across the United States. According to the EIA, the “Marcellus Shale region is now producing just over 14,000 million cubic feet of natural gas per day.” Pennsylvania is now ranked third in the nation for natural gas production, trailing just behind Louisiana. With natural gas production continuing to grow and proved reserves doubling in 2010, it may be only a matter of time before the Keystone State overtakes Louisiana for the number two spot in gas production. 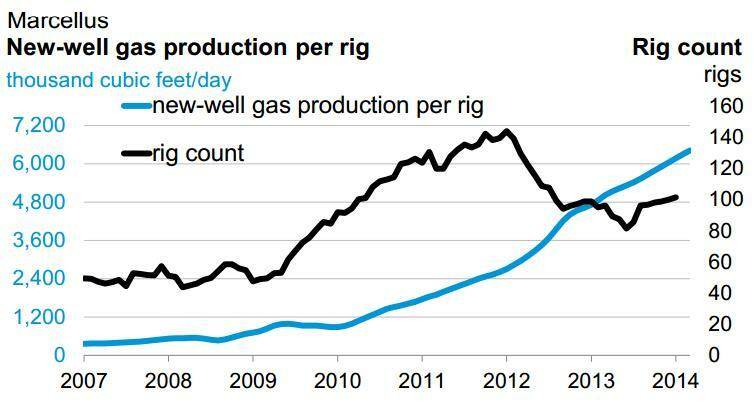 In one year new-well gas production per rig increased over 1,000 cubic feet per day. In one year the Marcellus Shale was able to increase output by over 4,000 million cubic feet per day. 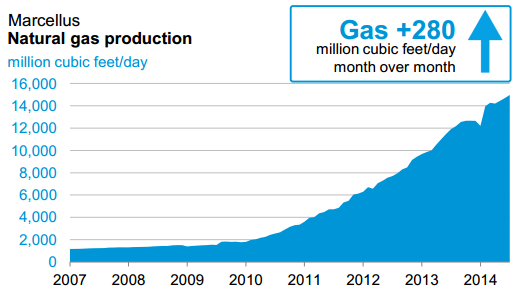 Marcellus natural gas production is increasing by 405 million cubic feet per day month over month. Notice in the graph below that, as Marcellus rig count decreases, natural gas production continues to rise. This is very telling when looking at development efficiency. The oil and natural gas industry is fueled by technology and innovation, and as each of those improves, efficiency during development also will. Prior to the surge in natural gas production, Pennsylvania relied heavily on resources from the Gulf Coast to meet its demand for natural gas. Thanks to the Marcellus Shale, the state is now meeting its own demand and even running a surplus to sell to others. The demand for natural gas has led to a need for infrastructure throughout the country, and working to complete this task has led to a resurgence in American manufacturing. This, in turn, has already created millions of jobs, with estimates that it will create 3.3 million jobs by 2020. Providing other states with clean burning natural gas has helped New York City achieve its cleanest air in 50 years. Besides the vast environmental benefits, giving more states access to this natural resource has helped lower energy costs and, perhaps more importantly, lower home heating bills during this frigid winter. Across the United States, shale regions have accounted for nearly 90 percent of domestic oil production growth and virtually all domestic natural gas production growth during 2011 and 2012. These numbers speak for themselves. Shale plays – specifically the Marcellus Shale – will continue to provide the United States with much-needed energy resources for years to come.